Northamptonshire Police are appealing for information regarding the theft of number plates from the front and rear of a vehicle that was parked in Bull Baulk, Middleton Cheney. This happened between 8pm on Tuesday 25th and 12 noon on Wednesday 26th September 2018. Did you see or hear anything in the area that was suspicious? Pet retailers and pet owners will be able to do more for animal welfare as a new licensing regime featuring five-star ratings comes into effect. South Northamptonshire Council hosted the Innovation & Investment Conference last week which showcased their renowned open for business approach and to most importantly, to thank all local businesses for their contribution to the local economy. Anti-social behaviour and low level crime affects people's life on a daily basis. Acts such as vandalism, damage to someone's property, noise, drunkenness, low level theft, or harassment can have a real impact on individuals, businesses and whole communities. 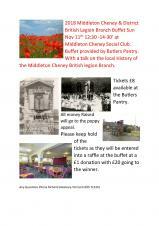 Sun Nov 11th12:30 -14-30'at Middleton Cheney Social Club. Buffet provided by Butlers Pantry. 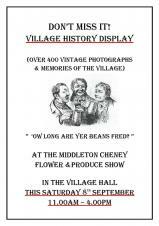 With a talk on the local History of the Middleton Cheney British legion Branch. Tickets £8 available at the Butlers Pantry. Operation Viper is Northamptonshire Police's crackdown on serious and organised crime. Serious and Organised Crime has no home in Northamptonshire and we need your help in telling us if you are aware of any issues in your area so we can investigate them.
" 'OW LONG ARE YER BEANS FRED? " Those expecting to be able to vote in planned or unplanned elections are being urged to respond to forms being sent to households in South Northamptonshire. Northamptonshire Police are appealing for information regarding a vehicle crime in High Street, Middleton Cheney. This happened between 10:30pm on Thursday 16th August and 6:30am on Friday 17 August 2018. Unknown person/s have gained entry to a silver van by forcing a hole in the rear door. Nothing has been stolen from inside the vehicle. HTML5 validated. WCAG compliant. Page generated in 0.3277 seconds.